Don and Robby Laidlaw are only the second owners of their 1935 mission revival-style home. Don grew up in the Sam Hughes neighborhood and went to the elementary school there. His wife says it's still a congenial place to live today. "We all know each other," Robby Laidlaw says. Margaret Davenport's repurposed bicycles, unicycles and carts serve as a garden entry to her home with her husband, Bill, on East Third Street in Sam Hughes. Her daughters "love to ride their bikes and walk the dog around the neighborhood," says Lisa Stokes, whose 1949 California ranch-style home features this backyard sanctuary. Colors explode inside the home of Bill and Margaret Davenport on East Third Street in the Sam Hughes Neighborhood. Ed and Lisa Stokes' home is a long, low 1949 California ranch-style house. Bill and Margaret Davenport bought their 1926 Spanish Revival home in the Sam Hughes Neighborhood more than 20 years ago. Editor's note: This is the next in our series exploring Tucson neighborhoods - the homes, the vibes, the people. Look for the "Where We Live" series monthly in Home + Life. When Don and Robby Laidlaw moved into their home in the Sam Hughes Neighborhood 32 years ago, it was like coming home for Don. "This is where I learned to ride my bicycle," said Laidlaw, a member of the Sam Hughes Elementary School class of '47. "With all the streets lined with trees, kids would have orange fights. We had a path that a half dozen of us would take every year for trick-or-treating." He and his pals would pedal their bikes to the University of Arizona, where they just might have sneaked into a few football and basketball games. Laidlaw would collect foul balls and homers hit out of the baseball stadium. It was a great place to be a kid. "It means something to me to be back here," said Laidlaw, who worked in city planning for many years. "It's a real community." Today, the Laidlaws enjoy the activity of the neighborhood. They moved into Sam Hughes in 1981, becoming only the second owners of their 1935 mission revival-style home on Third Street. The home was built by a brother-and-sister team. He was a professor in the College of Agriculture and Life Sciences, she was a buyer for a downtown dress shop. Tragedy struck when a gas explosion in the home killed the sister and injured her brother. The professor later married and lived in the home with his wife. After their deaths, family kept the home until the Laidlaws bought it. "We all know each other," Robby Laidlaw said of the neighborhood. "No one stays inside their house behind locked doors. This is a pretty wonderful place to be." This square-mile neighborhood is bounded on the north by Speedway Boulevard, on the south by Broadway, on the west by Campbell Avenue and on the east by Country Club Road. Development started in 1921 and the enclave was named for local business leader Sam Hughes, who was instrumental in establishing Tucson's public school system. Significant neighborhood features include Sam Hughes Elementary and the 24-acre Himmel Park and Himmel Park Branch Library. While 16 architectural styles are represented, the majority of homes are constructed in the Spanish eclectic style. Designated as an historic district in 1994, Sam Hughes evolved over a period of 35 years, according to documentation nominating the neighborhood as an historic district. Half of the historic homes were built during a construction boom lasting from 1923 until 1932. Among the builders in the area was John W. Murphey, a UA graduate who was one of the most influential developers in Tucson. He teamed up with Josias Joesler, who borrowed from the architectural heritage of the Hispanic culture to develop a local flavor. The architecture of Roy O. Place is seen throughout the neighborhood, and in his design of Sam Hughes Elementary. Today, the neighborhood is composed of more than 2,000 residences, businesses, schools and places of worship. Some of the homes are close to their original condition. Others have undergone extensive remodeling. It's challenging to find two homes that look alike. While home values vary greatly, most are valued at $200 per square foot. Lisa and Ed Stokes live in the neighborhood with daughters Rowen, 16, Livian, 13 and Greer, 10. They moved here from New York 13 years ago. "We really loved the architecture," said Lisa Stokes. "The girls love to ride their bikes and walk the dog around the neighborhood. It's a great place to have a family." Denice Blake and John Blackwell moved to Tucson from northern Virginia in 1999. Blake peeked into the window of a little ranch-style home built in 1948 that was badly in need of attention. She and Blackwell fell in love with the spot. They took off the roof and transformed the property into a brightly-colored home with the feel of a Spanish hacienda. "I dreamed my whole life of living near a library," Blake said. "There is nothing you need that you can't walk or bike to here. You have the Loft Cinema, Rincon Market, Casa Video and so many cool businesses in the neighborhood, including three art stores - Lion'sGate Antiques, Arte de la Vida and Morning Star Traders and Antiques. It's just a great place to live." Chuck and Claire Albanese live in a contemporary home on Fifth Street that was designed and built in 1974 by Albanese, the retired dean of the UA College of Architecture. "The great thing is a lot hasn't changed in the neighborhood," he said. "It's just gotten richer." The couple raised their three children in the home. Chuck Albanese was successful in starting a soccer league at Himmel Park, where he coached his kids. All three of them worked in the pastry department at Rincon Market. For years they lived next door to a judge who would marry 20 to 25 couples a weekend at his home. If there were no witnesses, sometimes the Albaneses would stand in. Their home is designed to be energy efficient. It includes a courtyard, with walls painted Mansfield Middle Junior High pink and a painting studio, citrus trees and a patch of grass perfect for wrestling grandkids. "We have had many opportunities to move up to the foothills, but we like it here so much," he said. Former Canadians Margaret and Bill Davenport moved into what they jokingly call "the crack house," with an enormous crack in the front of the home. 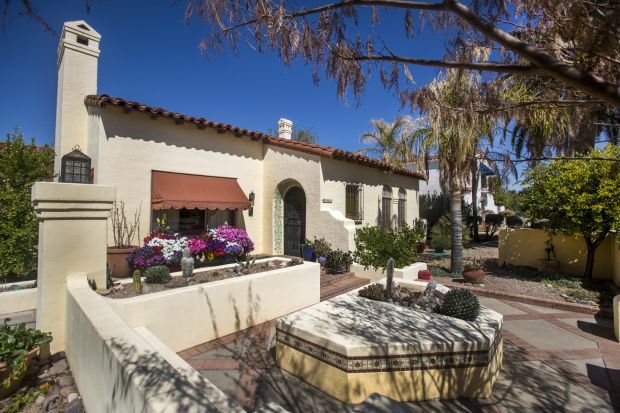 They lived next door, and bought the 1926 Spanish revival home on Third Street in 1992. They repaired and remodeled the home, turning it into a brightly-colored, whimsical showcase for Margaret Davenport's repurposed art. The home is part of the April 7 tour. 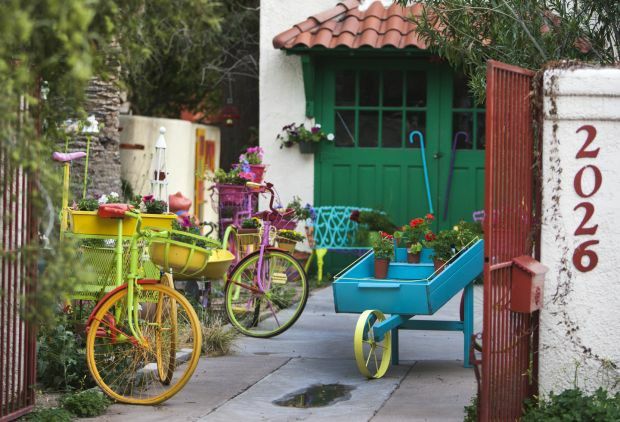 Her garden features bicycle art - old bicycles and unicycles that she paints and turns into planters overflowing with colorful blooms. Inhabiting the garden is Missy, an orange feline with mesmerizing green eyes. "I like the activities of the people going by - the cyclists, the walkers, the runners," she said. "I get to know the students." Anne and Mike Spacone have lived in a 1931 exposed adobe home for a dozen years. Their two youngest children attend Sam Hughes Elementary. The family zips around the neighborhood in an electric golf cart, or they walk and ride bikes. "We love walking to football games at the university, and we love the school," she said. "The neighborhood is really pretty, with the beautiful architecture and the different mix of families. I like that it has a history. It feels like a really well-balanced life." Sam Hughes was a Welsh immigrant who came to the United States in 1837 as a boy. He never attended a day of formal schooling and when his parents died, he helped raise his eight siblings. Hughes became a successful merchant during the California gold rush, but developed tuberculosis and came to Tucson by stagecoach in 1858 to die. In fact, he soon recovered. When Confederate forces occupied Tucson at the onset of the Civil War, Hughes returned to California rather than live under the Confederate flag. He accompanied the first battery of Union soldiers to return to Southern Arizona in 1862. Hughes married Atanacia Santa Cruz in 1863 and they had 15 children. In the early 1870s, Hughes helped to incorporate the city of Tucson and served as an alderman on the first city council. One of Tucson's most successful businessmen at the time of the Camp Grant Massacre in 1871, Hughes supplied the raiders with rifles and ammunition. That same year he helped establish public education, saying it was "the pride of my life." He died in 1917, and in 1928, the new elementary school in what was one of Tucson's first subdivisions was named after him. Sources: Sam Hughes Neighborhood Association, Arizona Historical Society and Arizona Daily Star archives. • What: The 2013 Sam Hughes Historic Neighborhood and Home Tour features 20 venues - homes, gardens, businesses and sample-serving restaurants. Not all of the homes featured in today's story will be in the tour. Casitas on Broadway, 2121 E. Broadway. This senior living complex, built in 2010 with 57 units and a long waiting list, transformed property that was once home to a series of car dealerships. Benedictine Monastery, 800 N. Country Club Road. Built in 1940, this monastery sits just outside the Sam Hughes boundaries. Today, 26 sisters live a contemplative life of prayer, charity, and oversight and maintenance of the building. The new hotel Aloft Tucson University, 1900 E. Speedway. Theta Chi Fraternity House, 502 N. Campbell Ave. When 24 members of the fraternity heard a new apartment building was being built across the street the UA, they were quick to move in. • When: Noon to 5 p.m. April 7. • How much: Tickets are $20, available starting Thursday at Arte de la Vida, 37 N. Tucson Blvd., or day-of-tour at Rincon Market, 2516 E. Sixth St.
Himmel Park is named after pioneer Tucsonan Alvina Himmel Edmondson and her family. She and her husband, Charles S. Edmondson, came to Tucson from New Orleans in 1897 and homesteaded on 160 acres near Speedway and Tucson boulevards. The couple divorced and Alvina sold part of their homestead to the city in about 1934, with the stipulation that the site be named after the Himmel family. In 1944 the city council purchased more land to expand Himmel Park and started planning for the Himmel Park Library, which was built in 1961. Edmondson died in 1948 at age 78 at her redwood home in the Sam Hughes Neighborhood on land she homesteaded for 51 years. Source: Sam Hughes Neighborhood Association. The Jefferson Park neighborhood, which started in 1900, has recently been given historical status.